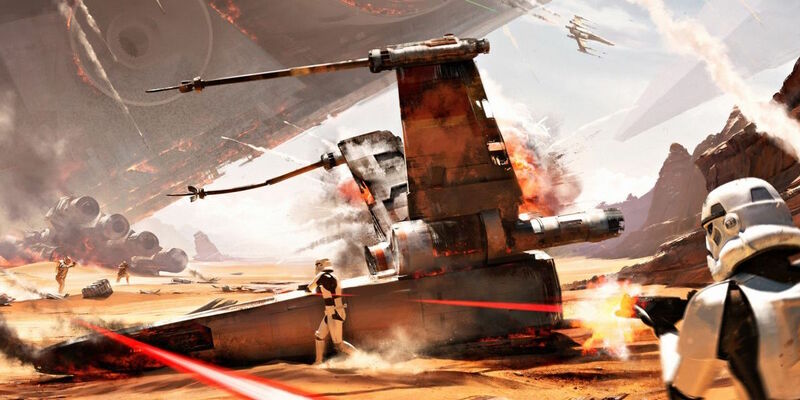 Star Wars Battlefront, the recent franchise release from video game developer EA DICE and publisher Electronic Arts, has already released to tepid fanfare. Many reviewers have cited the title's overall lack of content in the face of its visually appealing design, making it little more than a shallow movie tie-in gaming experience. And yet this new reboot of the storied action-shooter series still wishes to revitalize the gaming property ahead of Star Wars: The Force Awakens, which is a facet that may well prove integral to the narrative merit of the game's first batch of DLC content. As anyone knows who has watched the many trailers leading up to the late December 2015 release of J.J. Abrams' Star Wars: The Force Awakens, the planet Jakku will play a significant role in the film, and is the setting against which players of EA DICE's latest release may expect to explore ahead of the opening credit scroll of Episode VII. Supporting content that takes place twenty-nine years prior to the start of the new movie, players of the new Battle of Jakku campaign can expect to traverse two new maps, featuring an epic new mode that is sure to deliver on all of the promise entailed in the latest trailer featured above. Following the Battle of Endor at the end of Return of the Jedi, Abrams' new site of interplanetary dispute is set to be the final resting place of the galaxy's holdout Imperial forces. The upcoming film is set to feature merely the remains of a battle long since won, though players can be sure to take part in the action that will be history in the new movie. For anyone still on the fence before about purchasing the latest playable title set in the Star Wars universe, the Battle of Jakku might just sway those willing to put money down for the chance to explore one of the franchise's latest interstellar set pieces. Even if the original series from the mid-2000s remains the high point of the gaming franchise, it's hard to pass up another opportunity to explore Lucas' cinematic vision, no matter the medium in which it is presented. Star Wars Battlefront is available to purchase from all participating retailers for Xbox One, PlayStation 4, and PC. The Battle of Jakku DLC will be available to download for free on December 8th, 2015.